New pics from the upcoming Deadpool movie surfaced, and we got a look at all the characters that have been announced so far. 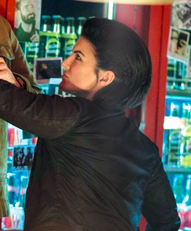 Let’s start from the not-so-defenseless girl seen lifting a guy with a single hand: that’s Angel Dust, and she’ll be portrayed by Gina Carano. Not much is known about her role in the movie, not even if she’ll be an ally or an adversary of Deadpool (seeing her beating Weasel is not a hint, since Deadpool himself usually mistreats his “best friend”), but she apparently retained her powers, at least superhuman strength. 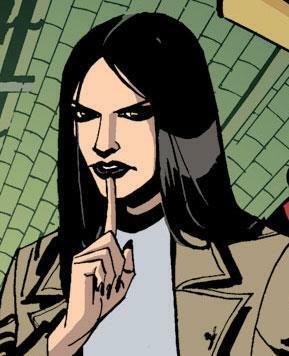 Anyway, waiting to learn something more from the movie, let’s see who she is in the comics. Christine (sometimes spelled Christina) was born in Chicago, Illinois. She lived a happy life in the suburbs with her parents, until the day her powers manifested for the first time: Christine realized she was a mutant, belonging to a world different from everything she had known thus far. Since she couldn’t properly control her abilities (her superhuman attributes were triggered by adrenaline, and she risked to go berserk if the hormone’s levels went too high), she was afraid she might have hurt her parents, and she even feared their possible reaction in learning they had a mutant daughter: Christine decided to leave her home, and she became a runaway. She avoided contacts with anyone she knew, and even when her parents started to look for her desperately, she refused to come back. Eventually, she met The Postman, another mutant like her, who lived as an outcast along with others in one of the city’s abandoned subway stations, in the Chicago division of the Morlocks. Believing she had found a new house and family, Christine, who now called herself Angel Dust, joined the Morlocks, and dedicated her life and her powers to protect her new siblings. In the time she spent living in the subway, Angel Dust learnt to think like a Morlock, making a strong division between her mutant brothers and sisters and the “world above”, inhabited solely by people ready to arm her and the others. This new philosophy of life received some sort of confirmation the moment the Morlocks saved an elastic mutant, Cell, from the local police: Angel Dust herself knocked out several cops who were opening fire on Cell for apparently no reason, and the mutant became a new recruit for the Morlocks. Despite loving her new family, Christine didn’t like the life in hiding the Morlocks had chosen, and she even argued with another mutant, Electric Eve, who called her a stupid for running from home, and told her to resign herself to spend the rest of her life underground. Eve made Angel so angry that she eventually lost control, and she unwillingly attacked Cell and Shatter in her rage, then she fled, feeling guilty. Shatter reached her and brought her home, but that same night the entire group was attacked by the Sentinels, robots programmed to hunt for mutants. 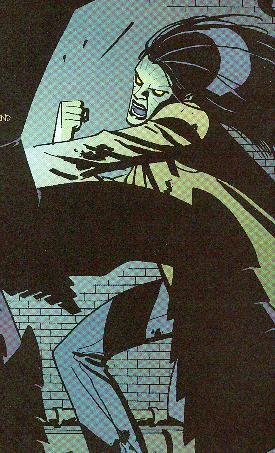 Shatter was wounded, but the Morlocks made it back to their hideout, only to find out the police had already found it. While the mutant Trader was killed in the gunfight, Angel Dust tried to shield Shatter and the others, begging the policemen not to hurt anybody else… but the men just realized how pretty she was, and programmed a “different kind of fun” with her; before they could lay a finger on the exhausted girl, however, Electric Eve intervened and killed them all, but one, whose mind was erased by The Postman. After the battle, Postman had his group on the move again, since the shelter wasn’t safe anymore, but before going to a secret hideout in the sewers, he brought Angel back home, since she deserved a closure before moving on. Christine was afraid of confronting her parents, but she did it anyway: she found them surrounded by missing posters, and she confessed to them that she was a mutant, but instead of the refusal she was expecting she heard her parents telling her they didn’t care, she was their daughter and they loved her anyway. Crying, Christine realized she had to leave nevertheless, since the Sentinels were still looking for her, and staying would have meant to put her parents at risk. There was only one thing the Morlocks could do to free themselves from the Sentinels, as their teammate Litterbug explained: they had to disable the Sentinel Central Control. For Angel Dust, now, this was a mission to regain her freedom, her life, and her family. Christine is a perfectly normal girl, thrown in utterly abnormal situations: pretty insecure and in need of affection and approval, she doesn’t truly accept her nature as a mutant, and she embraces a life of hiding just to avoid to confront her own fears. She’s fiercely protective of her fellow Morlocks, and she’s ready to sacrifice her own life for them. As Angel Dust, her mutant powers allow her to elevate her adrenaline level far above regular human one, gaining superhuman strength, durability, speed and stamina in the process; due to the nature of this power, however, she hasn’t full control over it, and it’s triggered by rage, fear or stress, leading her to a berserk state anytime she lets herself be overwhelmed by emotions. The adrenaline level decreases quickly, and when her superhuman strength is gone, Angel Dust is left exhausted for some time. Escaping from a world that hates and fears her for what she is, Angel Dust fights for her and her friends’ survival, dedicating her life to fulfill the “last wishes” of the ones who share her destiny with her.